KEEPS LIQUIDS COLD 24 HRS | HOT 12 HRS - Double walled insulation tech makes Fnova bottle the best stainless steel insulated water bottle you will ever need. Your favorite beverages will keep in cold for a whole day and hot for the most day / night in the car, on the beach, at the gym, road trip, hiking, camping, working, home & of course lunch boxes! IMPORTANT NOTICE: For a better customer experience, The sports cap has been eliminated due to it's defective design. 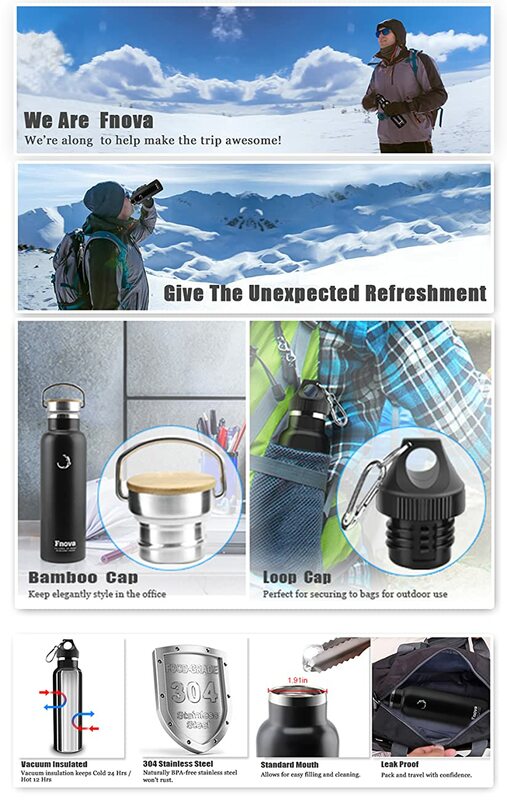 So the water bottle of the latest inventory is only with two lids: ★ Loop Cap with carabineer offers convenient, easily access hydration while outdoor; ★ Steel Bamboo Cap is attractive and eye catching that will perfectly fit your office or workweek routine! PREMIUM 18/8 STAINLESS STEEL BPA FREE SPORT BOTTLE- Time to help your wallet and the environment with our BPA free stainless steel water bottles and avoid single use plastic bottles. No metallic taste, No Toxins and Chemicals Leaching, Eco-friendly, Safe to use by the whole family. OUTSTANDING PERFORMANCE WITHOUT SWEATING - Fnova top quality power-coated matte finish exterior will never sweats from condensation when using iced cold drinks. No More Dripping! Silicone ring on the cap ensure Zero Leaking. Black Matte finish make it look good wherever you show it off. 100% SATISFACTION GUARANTEE & 18-MONTH WARRANTY - If, for whatever reason, you don't absolutely satisfy with Your Fnova water bottle, just contact us to return it, and we'll refund every penny (or replace it, if there is a problem). A good day may be spoiled by unpleasant smell and cold beverages in Plastic Bottle or Single Walled Metal Bottle. Finally, your searching for the perfect insulated water bottles is end! Manufactured from superior BPA-Free stainless steel, Fnova Water Bottle is built to last, and unlike cheap plastic sports bottles, won't leech chemicals or toxins into your drink, for safe reuse! The Fnova power-coated matte finish exterior will not only improves the bottle's grip and feel, but also cause no sweating even in the most humid environments. No more puddle or drips on your desk or shirt! Say Goodbye to cheap plastic bottles and single wall steel bottles Today! What is the recommended way to clean this? I use a bottle cleaner and shake it . can you purchase replacement straws for this bottle? Sorry currently, we don't have replacement straws for sale. If you buy the straw elsewhere, make sure that the size of straw match with the the hole on the lid. What is the bottom diameter? For the 35oz bottle, it's around 11 ? inches tall(the cap is not counted). The inlet diameter is bit less than 2 inches. Bottom Diameter is around 3 1/4 inches. For the 21oz bottle, it's around 8 3/4 inches inches tall(the cap is not counted). The inlet diameter is bit less than 2 inches. Bottom Diameter is around 2 3/4 inches. These double-walled bottles do a good job insulating both hot and cold. You may read this and it'll be quite helpful. Does the 35oz bottle fit "regular" size ice cubes? Yes, the wide mouth makes it easy to include ice cubes into your beverage. Ice lasts a long time too. I noticed that the bottom of the interior is textured, is that a different material? Does it serve a purpose? The outside part is made of 201 stainless steel. For the internal part, we use premium 304 food grade stainless steel, BPA free. No metallic taste, No Toxins and Chemicals Leaching, Eco-friendly, Safe to use. Moreover, we adopt double walled insulation tech to enable the bottle do a good job insulating both hot and cold for long time. You can refer to this review, the reviewer did test. What is the diameter of bottle for both the 21 and 35 ounce? For the 35oz bottle, it's around 11 1/2 inches tall(the cap is not counted). I can't find anything online about the Fnova water bottle or the company that makes these? Does anyone have any information? Our factory is in the Hardware Capital of China-Yongkang city. By virtue of the regional advantage of China Hardware Capital, we have advantages in material purchasing, workmanship, technology and quality. I am looking for 35oz bottle. does it fit into an suv cup holder. It depends. It is taller than it is wider. It should fit inside the cup holder but it might be too tall for what you are expecting. It is over 12 inches tall and somewhat top heavy (especially if you use the metal top). Is the warranty for 18 months or lifetime? Hi, we provide 18 months warranty. If there's quality issue, you just need to contact us(via Amazon message, or email to: support@fnova.net), we're ready to send replacement or refund without you returning the item. If it's over 18 months, then maybe customers need to pay some handling fee or shipping fee for replacement. ABSOLUTE BEST OF THE CLASS!!!!!!! This is the BEST water bottle I have ever purchased. I bought it to use at the office to help me drink more water. I like to drink cold water, so I fill the bottle with crushed ice & water. Wow...the water stays cold all day & there's ice still in it the next morning. Love it & highly recommend it. Totally meets my expectation; I drink more water than I ever have before (at least 3-4 bottles in 9 hours). I use the cap with the straw & carry it with me to meetings, lunch, etc. at work. It gets the attention of my co-workers & they always ask 'where did you get that; it's classy'. WOW....it's the ABSOLUTE BEST. A++++++++++. Best stainless steel product owned! I am so happy with this product, setting aside my sip lid broke, the stainless steel bottle holds enough water to get me through most my work day and it keeps things cold for at least 8 hours. It is a little heavy, but it also is a lot of liquid. There is no foul taste to the water like some plastic containers when water is in it too long. The 3 lids is also great bc with winter coming I can put hot tea in it and use the metal lid. Also customer service is great and already process,u my replacement sip lid! Awesome. Definitely a repeat customer this Xmas. Love the bottle and it does stay cold really well, even with the straw. The only complaint I would have is that it it's a little wide so it doesn't really fit into cup holders very well. I would say, make it a little longer and a little skinnier so it fits. Overall its a great purchase and I am very happy with it. Will probably get a smaller one as well. My husband has a hydroflask and it works just as good as that one at half the price.